Great news for Wholesalers & Retailers of Automotive, Motorcycle or Marine related products! We now offer online trade accounts for bonafide workshops and traders to benefit from discounts on genuine RAVENOL products. For groups or businesses wishing to purchase larger volumes, we can offer trade discounts and a 30 day account, subject to the usual checks. Please contact us on 01686 650640 or email info@ravenol.co.uk to chat to our friendly team about setting up an account today. 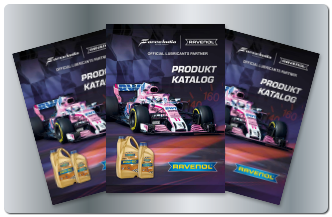 Our unique and eye-catching new look and brand image has been especially designed to underline RAVENOL‘s commitment to developing state of the art, high performance products which meet and exceed the demands of the future. The ergonomically and attractively designed retail packs are available in 1, 4 and 5 Litre sizes (Motorbike, Transmission and Marine Oils in 1 and 4 Litre) and are sure to attract customer Interest. Our constant customer focus has also led to new optimised packaging to make handling for the user as easy and safe as possible. Information on our unique packaging can be found in the Features-Flyer. For workshop customers we have 20 Litres, the fantastic looking drums above left are available the 208 Litre size, and of course, for bulk buyers, most products are available in 1000 Litre IBC's. We also have many products such as truck and tractor oils, industrial lubricants, greases etc. not yet listed in the shop - contact us for details. A full range of quality lubricants covering virtually every application. OEM Approvals on many products. Price stability through our policy of supplying only authorised Dealers. Comprehensive trade and retail support. State of the art eye-catching packaging. First class POS material + Display Stand (subject to minimum 1st order). Extensive product promotion through motorsport sponsorship, trade shows and social media. Order online, by e-mail or by phone. Free delivery to most UK Mainland areas when you order online. 30 day account subject to status or payment via PayPal or Card. As you can see - not only great quality but many other reasons why we differ to the rest, and that's not all. For example, when you call us you speak directly to one of our experienced team who is specifically there to help you. If you prefer you can simply order online or send us your order by email. So what are you waiting for? If you want to offer your customers some real quality, feel you'd like to be part of the fast-growing RAVENOL brand and become a RAVENOL Authorised Stockist then give us call now or fill out the form below.